A multi with a short stroll beginning at the village sign of Goudhurst. Goudhurst is a small village on the Weald of Kent. It is likely that the settlement began life as a clearing in the giant woodland of Anderida. The suffix 'hurst' is common among towns and villages in the area and means 'wood'. The origin of name's prefix 'goud' however is disputed, although there is a record of the name Guithhyrste from 1095. The church that stands in the heart of village, at the highest point of the area began life as a chaple that dedicated to St Mary the Virgin in 1119. The village evolved and geow around the church from then. In Tudor times the the iron industry playad a large part in the development of the area. The foundaries nearby are reported to have created the cannons used against the Spanish Armada in 1588. Other notable points in the life of the village include the Goudhust riots on 1830, invoked during the industrial revolution by those on low wages and in poor living conditions. There days Goudhurst thrieves on the farming and production of hops, one of the key ingrediants of Beer. Numerous Oast Houses built to process the crop can be seen all around this area. 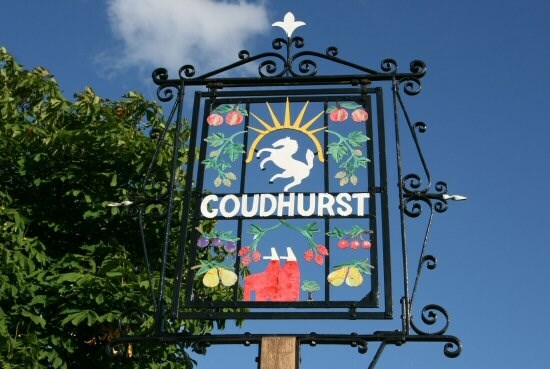 The population of Goudhurst stands at just under 3000. The village centre has a handful of shops and small business which mostly stand on the hill leading up to the church. Aparantly this area has hardly changed in the last 100 years. The village sign is made of iron, has the Kentish White Horse as it's centre piece and also includes oast houses, hop vines and various fruits farmed in the area. You will find it on the village green beside the pond in the heart of the village, where you will also be able locate all the information required to find the cache. Va n abbx va n gerr.